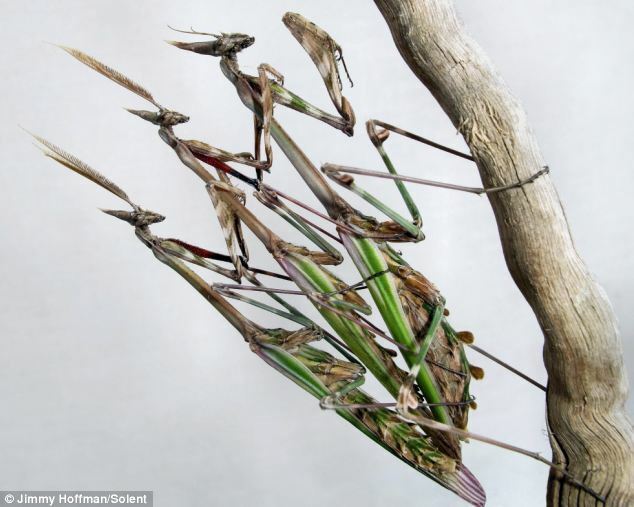 With bulbous eyes and their strange stick-like bodies, these mantises look like creatures from another planet. Perched on the tiny stem of a plant, one insect enjoys a lunch of tiny yellow aphids. 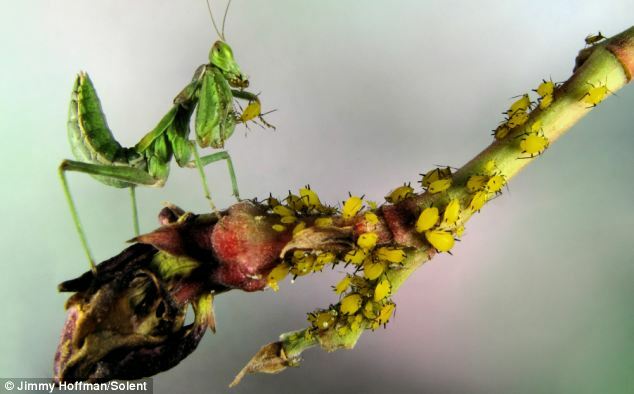 Another picture shows a mantis about to pounce on an unwitting butterfly and one incredible shot even shows the creatures in larvae form, not much bigger than a thorn. These incredible close-ups were snapped by wildlife enthusiast Jimmy Hoffman. The 50-year-old scours the vegetation around his home in the Costa Brava, Spain, looking for the insects. He said: ‘I’ve been interested in nature since I was a child and I’ve always had an eye for wildlife, especially insects. 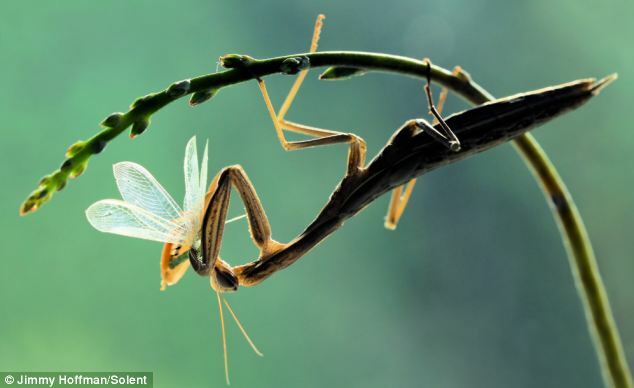 ‘Praying mantids are my favourite because of their special predatory behaviour, shapes and colours. ‘I also like the fact that they can rotate their head in all directions and seem to look at you in an almost intelligent way. ‘They can be found by thoroughly searching through vegetation. 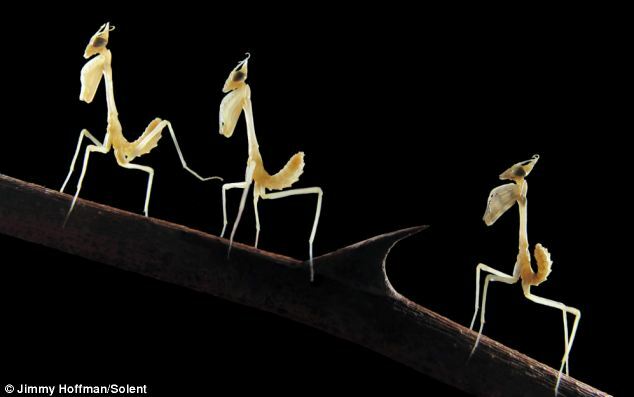 ‘The morning is usually the best time to do this because they often sit on top of plants and shrubs to warm up in the sun.’ As well as searching for mantises, Mr Hoffman collects the insects’ egg cases, which he takes home and hangs in his garden so he can watch them hatch. He said: ‘I have witnessed the emergence of the larvae several times, it’s a very special moment because they usually hatch all at once. ‘The young larvae are initially very vulnerable but they are able to move very rapidly and can jump a little.’ After finding his subjects, Mr Hoffman can spend up to two hours waiting to get the perfect shot. 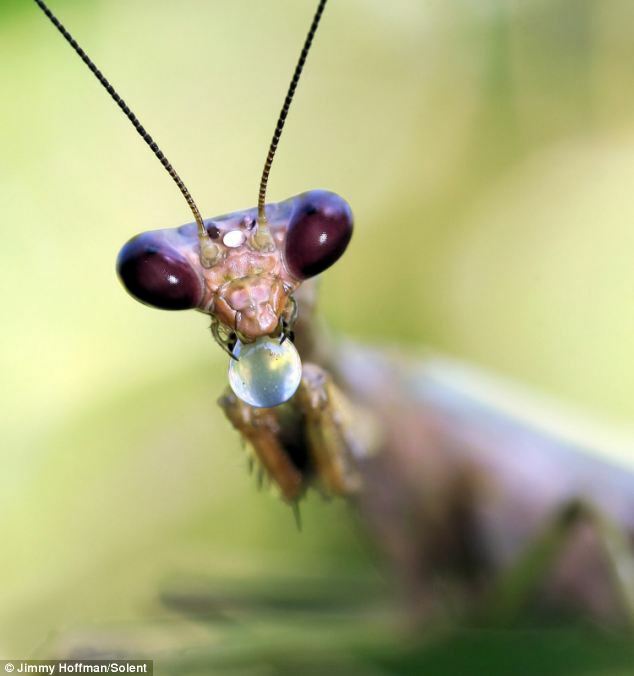 He said: ‘My favourite picture is of a mantis about to catch a butterfly. 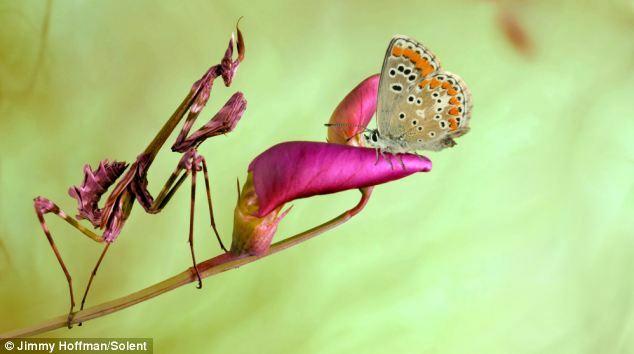 ‘Unfortunately for the mantis the butterfly was too fast and managed to fly away before it could be caught. 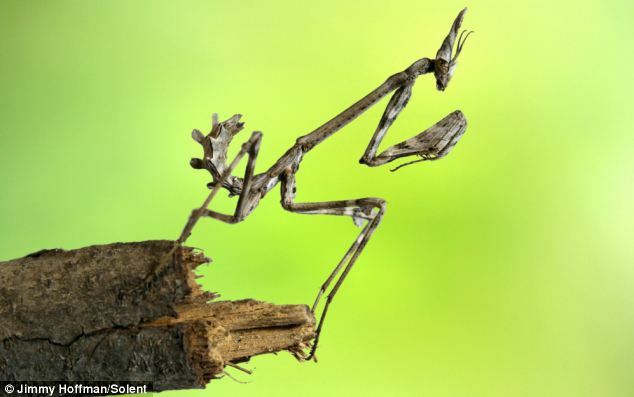 Despite their vicious appearance, Mr Hoffman has never been harmed by a mantis he has photographed – but admitted a friend had had the misfortune of being mistaken for prey. He said: ‘Mantids are real predators and grab prey which can be as large or even larger than themselves. ‘Once one of them saw my friend’s finger as prey and latched on, wanting to eat it. ‘Thankfully, we managed to extract the digit without causing any harm to my friend or the insect.